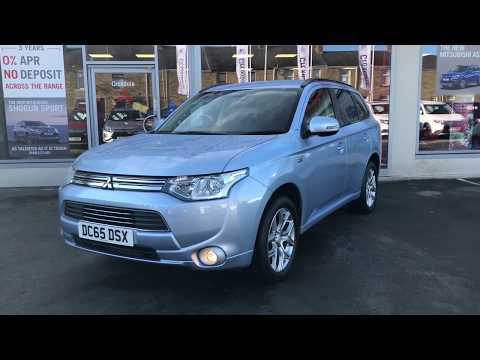 Here is our beautiful 65 plate Outlander 2.0 GX3h CVT 4X4 finished in a fantastic blue with full service history and having only covered 20,637 miles. This is a stylish and comfortable 4WD vehicle which is fitted with a range of exciting specification designed to ensure you have a smooth and entertaining driving experience including; dual zone climate control with air conditioning, radio with CD player and Bluetooth media streaming, multifunctional steering wheel, keyless entry, cruise control, hill start assist, rear parking sensors, automatic rain sensor wipers, electric front and rear windows, and electrically adjustable door mirrors. Buy with confidence knowing you will receive Mitsubishi warranty until 2020/100,000 miles, 12 month roadside assistance and 30 days exchange programme. This car is available to view and test drive at Croxdale Mitsubishi Durham, our Mitsubishi experts will ensure you receive a fantastic experience. We also have a range of finance options available from no deposit across our used car range. Buy from Croxdale Mitsubishi and you will have full peace of mind of a pre-sales inspection by Mitsubishi trained technicians. We are based on the A167, Durham - 5 miles from Durham City Centre. Let our family look after yours - Call our team on 01388 814671 - we look forward to helping you purchase your new Mitsubishi.